The summer season is upon us which means tons of fun in the sun! We love spending hours at the beach or a lazy day floating in the pool, but it's important to remember to protect skin from the dangers of the sun. Growing up, sunburn was almost like a rite of passage. We didn't know about the long term damage it can cause our bodies. Getting sunburn, just once every 2 years, can triple your risk of melanoma skin cancer. These days, we're much more informed about the dangers of sun exposure. Hats, sunglasses and some type of cover up are a must. Our family loves rash guards as a healthy way to enjoy the outdoors this time of year. They're comfortable in and out of the water and dry the moisture-wicking material dries quickly, so that you can wear them around as a top throughout the day. Most importantly, they provide an effective UV protectant for your skin. As someone who breaks out from most sunblocks, I am especially appreciative of rash guards. 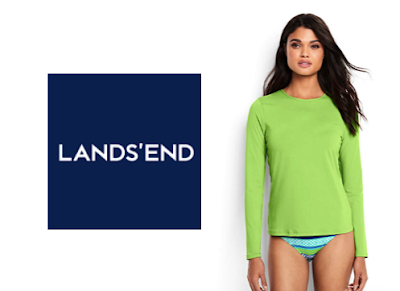 The people of Lands' End have a wide variety of rash guards to choose from and kindly agreed to let us try a few. Women's Swim Tee Rash Guard: While cover-ups can go just about anywhere, the one place they can’t is the water. This Swim Tee is the perfect piece for any outdoor fun. Designed to wear over your swimsuit top, it’s soft as your favorite tee and incredibly lightweight – even while wearing it in the water! It’s not just for swimming though. It also works as a colorful cover-up when the air turns cooler or you’re just looking to shade your skin. Plus it provides UPF 50 protection against harmful UV rays. 91% nylon/9% Lycra® spandex. Hand wash. Imported. Available in 5 colors. Men's Short Sleeve Solid Swim Tee: This Swim Tee offers the UPF 50 sun protection needed for a day on the water, and the t-shirt styling makes it a comfortable option for walking the dog or mowing the lawn, too. The soft, lightweight fabric also features a moisture wicking finish to help keep you dry and comfortable, stretch for comfort and flatlock seams that strategically follow the body for easy movement. 83% Polyester, 17% Spandex. Hand wash. Imported. Available in 4 colors. Men's Swim Tee Rash Guard: This is the long sleeve version of the short sleeve Swim Tee above. It also offers UPF 50 sun protection and is made of soft, lightweight fabric with moisture wicking finish to help keep you dry and comfortable, stretch for comfort and flatlock seams that strategically follow the body for easy movement. My husband prefers long sleeve rash guards for added protection, but it really depends on what's most comfortable for you. 83% Polyester, 17% Spandex. Hand wash. Imported. Available in 4 colors. 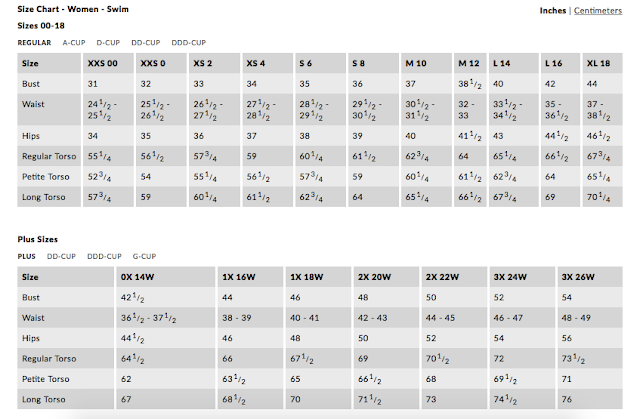 Check the sizing chart to decide which size to order. It should fit somewhat snug to your body, with enough stretch to give you room to move. After you purchase your rash guard, check out the Lands' End Garment Care page to find our how to care for your top. Remember, every sunburn can have serious effects in the future. Taking the proper precautions now will make your summer fun that much better! Disclaimer: The products in this post were provided by Lands' End. As always, our posts are our own, honest opinions.